VIDES Philippines celebrates the 2013 National Children's Month with a special program and get-together on Saturday, October 5, 2013 at Don Bosco School Manila, V. Mapa Extension, Sta. Mesa, Manila. VIDES Sisters and volunteers will join the children from the different areas of the Busina Mo, Dunong Ko (BMDK) Mobile Literacy Program in a day of fun games and enriching activities. There will be a quiz bee, a cheerdance competition, various art contests, and a mini concert. A Convention on the Rights of Children (CRC) skit will also be presented during the event. Rev Fr. Joey B. Tuzaon, Parish Priest of the Sacred Heart of Jesus will officiate the Eucharistic Celebration. Council for the Welfare of Children (CWC) Executive Director, Ms. Brenda S. Vigo, will grace the said event as special guest. 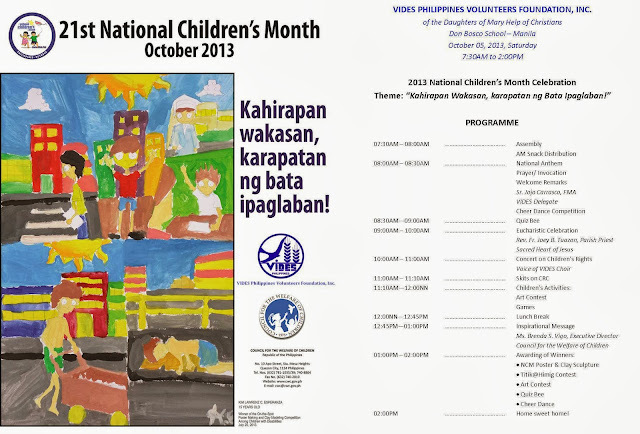 Pursuant to Presidential Proclamation 267, series of 1993, the National Children's Month is celebrated every month of October. This year's theme, Kahirapan, Wakasan, Karapatan ng Bata Ipaglaban! focuses on poverty. It highlights that poverty reduction starts with children and that education is the most promising intervention that can make a difference in the life of every child and his/her family.